Hutchinson Builders or more affectionately known as Hutchies, have capitalised on the building boom that is taking place in Brisbane, Australia. 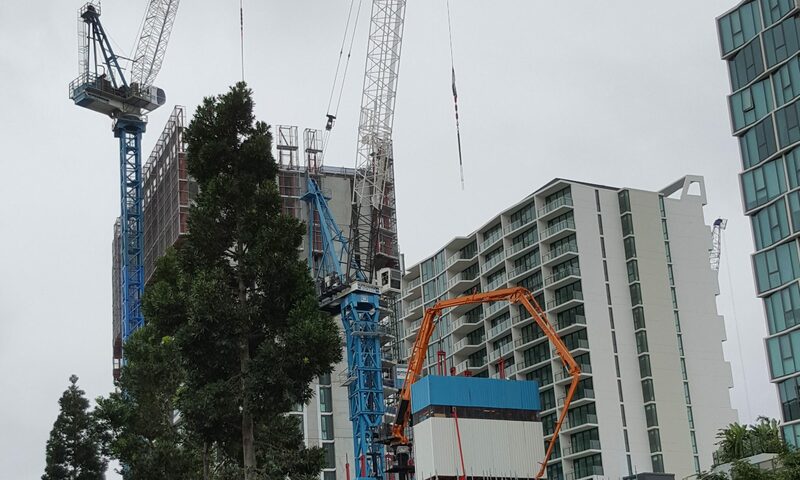 For the last few years, the skyline of Brisbane has been littered with tower cranes completing in this current round of high-rise construction. Some of Hutchinson Builders tower cranes around Brisbane. On any given day, no matter which direction that you look, you can see multiple tower cranes. Back in 2016, I had the pleasure of working in Fortitude Valley. Standing on the roof, you could look North towards Newstead and count 16 cranes without moving. Tower cranes over Newstead, Brisbane. 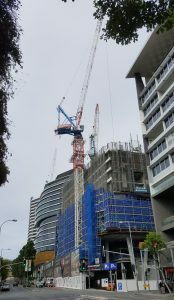 How many tower cranes are there in Brisbane currently? According to the RLB Crane Index for the 2nd Quarter of 2017, Brisbane has 81 tower cranes scattered across the skyline. 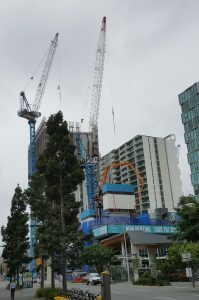 Brisbane’s tower crane count is down from 2016 3rd Quarter of 104 tower cranes. 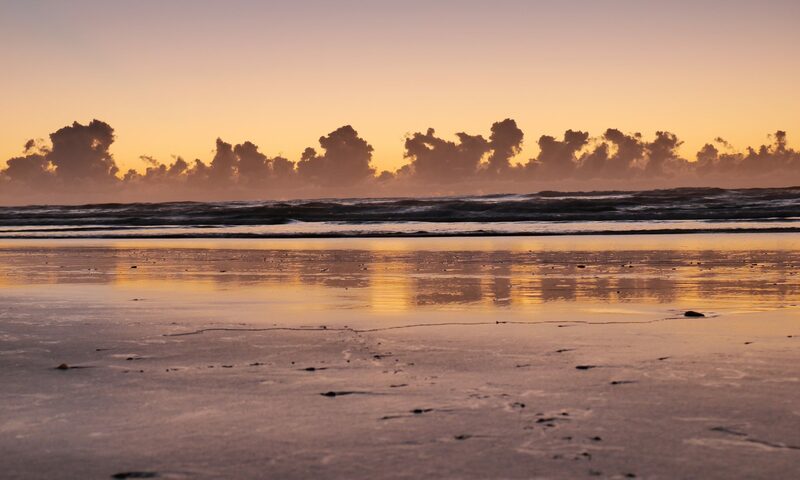 The number of cranes in the sky is the largest number that Brisbane has seen. There are a lot of other large builders in Brisbane contributing to the current shape of the skyline. Some of the notable large commercial builders include Brookfield Multiplex, Hindmarsh, Icon Co and Mirvac just listing a few. Then you have an absolute plethora of smaller commercial builders throwing up tower cranes all over the place, companies like Tomkins Commercial & Industrial Builders, Condev, Torre Developments and the list goes on and on. Hutchinson Builders tower cranes over South Bank, Brisbane. It’s not necessarily that Hutchies are the biggest or the best, they just happen to be the builder with their name everywhere. Travelling the streets of South Bank Parklands district, most of the construction site fencing has Hutchinson Builders banners wrapped around them. Heading north, the density of cranes begins to lessen. However, the familiar blue and white cranes stand out from the rest. Mostly due to the fact they are the ones standing the tallest. One block in Newstead, Hutchies have had the luxury (or the nightmare) to have three high-rises as next door neighbours. Hutchinson Builders well underway, Newstead Brisbane. The boom in Brisbane caused an interesting event for all subcontractors and tradespeople. With the amount of work available, just about every subcontracting company and tradesperson were able to name their price. You would watch guys wheel their toolbox out of one job site head down the street and walk straight into the neighbouring project. When a project’s timeline started to lag, finding additional site personnel was near impossible. Mostly, fancy reshuffling of site works was the only option available. Meeting the project’s timeline became an art form, not for the faint-hearted. As we head into the second half of 2017, it will be great to see the current high-rise boom continue; I guess time will tell how long this cycle has left. Previous PostPrevious 3D printing is not the death of construction, we are! Next PostNext Is Fix It Up shop fitting the future of construction?